Take a bowl and mix tapkir, sugar, water, vanilla essence and food colour properly so that there are no lumps in it. Take a dish, grease it with ghee and keep it ready. Take a kadai(wok) and heat ghee. Pour the mixture into ghee and stir it continuously to avoid lumps. Stir it till ghee leaves the sides. It shows that your halwa is ready. 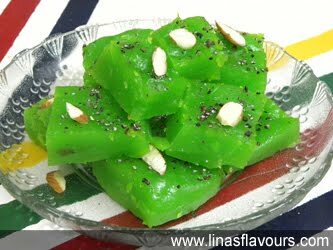 Pour halwa in it and spread it evenly. Garnish it with almonds and elaichi powder and let it cool. Put it in refrigerator to make it chilled. Cut into small pieces and serve it.